For a wide-range of image processing tasks (such as feature tracking, object recognition, stereo matching and remote sensing), Template Matching (TM) serves as a crucial strategy to allow the localization and recognition of objects and/or patterns within digital images. The purpose of a TM approach is to find the location (region) within a source image which manifest the best possible resemblance to a given sub-image (commonly known as image template). Any TM algorithm (independently of their particularities) incorporates two important elements: 1. a search strategy; and 2. a similarity measurement. In its simplest form, a TM method involves exhaustive search processes were a similarity measurement (such as the Normalized Cross-Correlation) is applied for each available location within the source image. Intuitively, such an extensive amount of function evaluations has a strong impact on the algorithms computational cost, an issue that happens to be extremely detrimental for many real-world applications. In the last few years, Evolutionary Algorithms (EAs) have been proposed as an alternative to aid on the search process of TM approaches by reducing the amount of locations that are evaluated within a given source image; however, it is known that many of these methods carry with them several critical flaws which could negatively impact the TM process, including an insufficient exploration of the source image (which often leads to premature convergence). 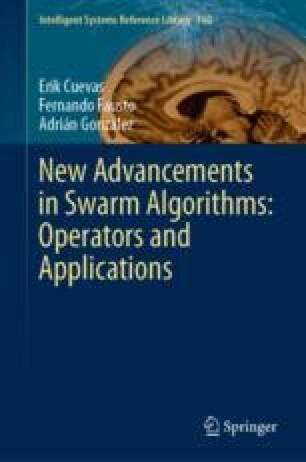 In this chapter, the swarm optimization algorithm known as Locust Search (LS) is applied to aid on solving the of template matching. The LS method includes a series of unique evolutionary operators that allows to explicitly avoid the concentration of search agents toward the best-known solutions, which in turn allows these agents to better explore of the available image’s search region. According to a series of experimental results, when compared to other TM approaches which integrates EAs as a part of their search strategy, LS achieves the best between estimation accuracy and computational load. Images dataset used on our experimental setup. a Waldo 1, b Circuit board 1, c Satellite image, d Waldo 2, e Circuit board 2, and f Circuit board 3.